Failure by the Supreme Court to hear a challenge to the 2012 California statute banning production and sale of foie gras has not only ended the unpleasant and cruel practice in the state but has eliminated a market for farmers in France. 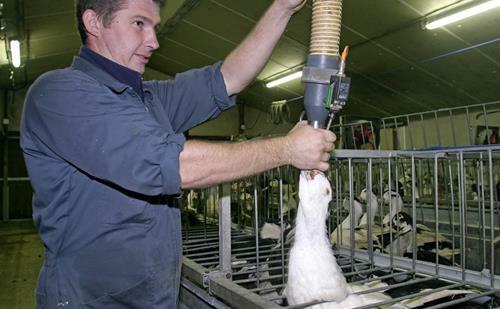 The practice of “gavage feeding” an euphemism for forcing feed in semi-liquid form through a metal tube into the distended proventriculus of restrained geese, has been banned in Denmark, the U.K., Germany, Finland, Argentina and Australia among other nations. Even in France, that counts foie gras as part of their gastronomic heritage, renowned chefs have spurned the product, as have some supermarket chains. France produces seventy percent of the World’s production and is slowly building back the market lost in Japan, the major customer, after embargos as a result of AI in 2016 and 2017. Continuation of the inhumane practice of gavage feeding to produce what is essentially a pathological fat infiltration of the liver would be detrimental to the overall image of poultry production. To claim that this sub-section of the industry is producing a “product conforming to hygiene regulations” ignores the overwhelming welfare consideration of force-feeding to produce an unhealthy product. It is axiomatic that trends and laws emerging in California ultimately spread eastward. It is predicted that state laws will soon be enacted by legislators and by ballot on the East coast. Elimination of Foie Gras production, a medieval practice, would benefit both the health of geese and consumers. Producers in France should consider another line of work and not rely on Japan. On second thought is their main customer now the only remaining nation that slaughters whales and dolphins for food?